Extra deep side pockets pack shoes, towels, toiletries, etc. During our testing period we made sure we used the garment bag with our finest duds. As you can see below, the hanger hooks onto a loop and can be secured so it doesn’t fall (the hanger) during transport. Notice the mesh pockets right above the shoulders of my clothing. Those are great for storing for storing small things like jewelry, deodorant, doodads and just about anything that could fit in there. Further down the bag is a security strap; this is great because it prevents your clothing from moving around and we all know that when clothes move around, the more chances of getting wrinkled. In addition you have another mesh pocket to store your g-string or if you like going commando and don’t have a need to store underwear, you can put socks in there. Beneath that is a padded pocket to store a laptop, iPad or a slice of pizza (wrapped of course). What you see below has to be my favorite feature of the bag. It has a reflective pattern that allows you to be seen while riding. Also you’ll notice the two large side pockets, you can put your shoes in there. I don’t know about you, but I like to wear cycling shoes when I’m riding and when I get to my office, I’ll slip on a fresh pair of work-appropriate footwear. The other side pocket can be used to store your lunch or whatever else you need to bring with you to the office. The top pocket is perfect for keeping a multi-tool, pump and snacks. The bag is equipped with briefcase handles as well as a detachable shoulder strap. Having both options makes it much easier to carry with you. By the way, you can even travel on an airplane with this bag since it meets airline carry-on requirements. Notice the reflective rain cover that the Garment Pannier comes with. It’s Hi-Vis to help drivers see you on the road during a down pour. I didn’t get an opportunity to test that feature since living in Southern California, we rarely see rain, all thanks to the drought. 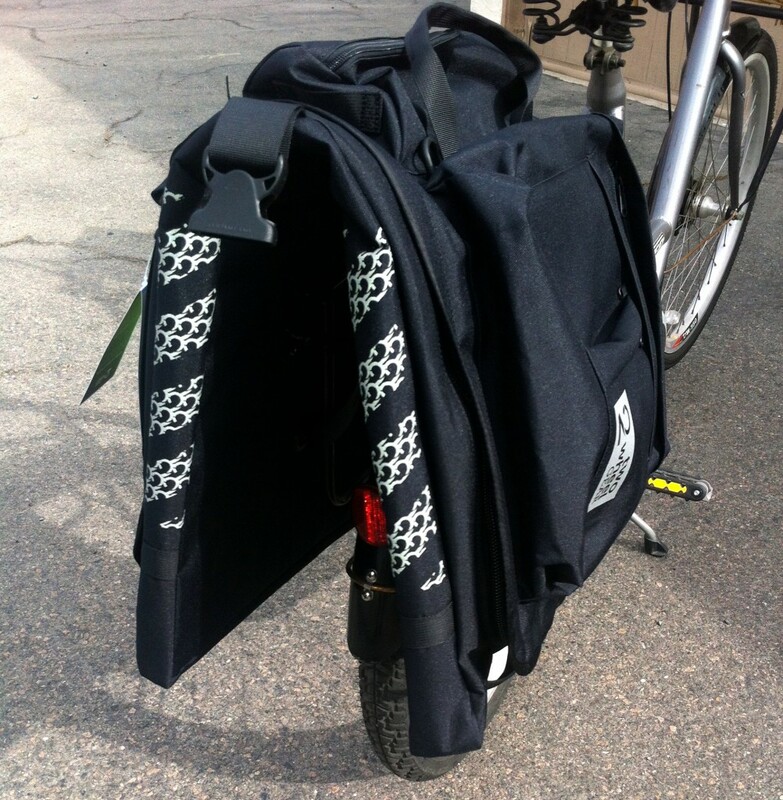 The Garment Pannier is equipped with a great locking mechanism that ensures that your bag will not fly off your rack. It uses something called Universal RIXEN & KAUL Vario mounting system. It’s pretty self explanatory on how it works, but you can read all about it HERE. Please forgive my shoddy photo, I’m still trying to convince the boss to let us upgrade our camera from 1993. But you get an idea on how it mounts from this photo. Now that you’ve got an clear understanding on how the bag is supposed to work, let’s get into the nitty gritty of the review. I used it for a few hundred miles during our testing phase. I’ve even used it to travel to various trade shows in various parts of the country. One thing that stands out with the Classic 2.0 Pannier is that it really is a versatile and robust bag. Not only is it easy to use, but it’s pretty tough. It must be the 600D polyester they use because this bag has seen some asphalt in its day. There was a few times where I haphazardly mounted the bag without securing it and decided to jump a speed bump or ride off the curb and down went the bag. A few times it slid down the road for about 10 feet. But nothing happened to it! The material was still in great condition, none of the hardware broke, and my stuff in side was still intact. I think the most appealing part about this bag is it’s looks. Nothing about it screams that you’re a bike commuter. I like how it’s not bulky like other panniers I’ve owned. It’s professional looking and may I add, very handsome. So if you want to look like a boss when you get to work, make sure your clothes don’t look like you just pulled them out of the hamper. No! Arrive looking crisp and fresh. But you can’t do that with just a plain pannier bag. Those other bags will leave your office attire all jacked up and molested looking. The Classic 2.0 Garment Pannier is the way to go. Consider it an investment for your career and if you’re self-employed, I’m sure you could write this bag off somehow.